In recent years, Belgians with an immigrant background have become an important electoral force in Belgian cities and in particular in the Brussels-Capital Region. Literature on the choice of parties and the voting characteristics of Belgians with an immigrant background is, however, lacking. In this article, we shall present the first analysis of the electoral characteristics of young students with an immigrant background in the Brussels-Capital Region who were voting for the first time in 2007. We have attempted to determine whether pupils with a non-European immigrant background have a special electoral profile which cannot be explained by other sociodemographic characteristics, such as their socioeconomic status or their educational orientation. Contrary to our expectations, after controlling a series of mediating variables, the country of birth of the mother of young students, still has a significant impact on their voting intentions. Au cours des dernières années, les Belges issus de l’immigration sont devenus une force électorale non négligeable dans les villes belges et particulièrement dans la Région de Bruxelles-Capitale. La littérature sur les choix de partis et les caractéristiques de vote des Belges issus de l’immigration reste cependant lacunaire. Dans cet article, nous présentons la première analyse des caractéristiques électorales des jeunes rhétoriciens issus de l’immigration de la Région de Bruxelles-Capitale se rendant pour la première fois aux urnes. Nous avons tenté de découvrir si les rhétoriciens issus de l’immigration non européenne ont un profil électoral particulier, qui ne peut être expliqué par d’autres caractéristiques sociodémographiques, telles que leur statut socio-économique ou encore leur orientation scolaire. Contrairement à nos attentes, le pays de naissance de la mère des jeunes rhétoriciens a, après contrôle pour un ensemble de variables médiatrices, toujours un impact significatif sur leurs intentions de vote. Sinds enkele jaren zijn de allochtone Belgen een niet te verwaarlozen kiezersgroep geworden in de Belgische steden en al helemaal in het Brussels Hoofdstedelijk Gewest. Wetenschappelijke literatuur over de partijkeuze en het stemgedrag van die categorie Belgen blijft evenwel schaars. In dit artikel presenteren we een eerste analyse van het stemgedrag van allochtone leerlingen uit het laatste jaar middelbaar onderwijs in het Brussels Hoofdstedelijk Gewest. Het gaat om leerlingen die voor de eerste keer gingen stemmen. We hebben getracht na te gaan of de allochtone leerlingen (met name deze van niet-EU-origine) – in vergelijking met autochtone leerlingen – een specifiek kiezersprofiel hebben, dat niet kan worden verklaard door andere sociodemografische kenmerken, zoals hun sociaaleconomische status of hun studierichting. In tegenstelling tot onze verwachtingen heeft het geboorteland van de moeder (dat we als indicator voor vreemde origine hanteerden) van de laatstejaars, na neutralisatie van de effecten van een aantal sociodemografische variabelen, inderdaad nog altijd een significante impact op hun kiesintenties. Allochtone jongeren kennen dus wel degelijk een specifiek kiesgedrag. 1Brussels is a multicultural region par excellence. The diversity of the regional political scene also attests to this. The political representation of people with an immigrant background has increased greatly in recent years in the Brussels region, even reaching an unequalled level in the European Union. One may even speak of an immigrant political class in the process of professionalisation (Jacobs et al., 2006). 2The growing visibility and importance of this political class is not due to the recent local enfranchisement of non-nationals, as this right was exercised by relatively few people during the last municipal elections in 2006 (Teney and Jacobs, 2007). Other factors – such as the measures to relax the naturalisation legislation or the emergence of youths with an immigrant background who are old enough to participate in political life – have played a much more important role in this evolution. Belgians with an immigrant background have indeed become an important electoral group. 3The present contribution lies within this context of diversity in both the population and the political class in Brussels. Whilst the link between participation in immigrant associational life and investment in the political life of the Region has been demonstrated (Jacobs et al., 2004) and the profile of political candidates with an immigrant background in the Brussels region has been analysed in depth (Jacobs et al., 2006), the electoral preferences of the population with an immigrant background still remain largely unexplored. This contribution aims at filling this gap. We shall examine the voting intentions of young students in Brussels who represent the multicultural character of the region’s population as a whole. By “young students”, we are referring to pupils in the last year of the secondary education who, during the 2007 federal elections, voted for the first time, and by “young students with an immigrant background”, to pupils in the last year of the secondary education of Belgian nationality whose mother was born in another country. 4The underlying question in this contribution is whether new voters with an immigrant background have special electoral characteristics. We expect that when controlling voters’ socioeconomic characteristics, the electoral preferences of young students with an immigrant background will not differ from those of students who do not have an immigrant background. Indeed, socioeconomic status and origin are strongly associated within the Belgian population (Phalet et al., 2007). Furthermore, socioeconomic status is traditionally one of the determining elements in voters’ party choice. It is therefore very likely that the electoral characteristics of young students with an immigrant background may be largely determined by their socioeconomic status (or that of their family). 5In spring 2007, we conducted a large quantitative survey among students in the last year of the secondary education attending the schools of seven municipalities in Brussels.2 88% of schools – encompassing all tracks, educational networks and the two linguistic schooling systems (but excluding the international schools) – which make up the educational environment in these municipalities (i.e. a total of 70 schools) participated in the study. All pupils (in the last year of the secondary education) in the participating schools who were present during the data collection filled in a questionnaire regarding their opinions and attitudes in various areas. One of the topics in the questionnaire concerned the voting intentions of pupils for the 2007 federal elections. The analysis of the voting intentions of young students discussed in this contribution is, however, solely based on pupils of Belgian nationality who expressed an intention to vote for one of the French-speaking parties. Thus, the pupils of foreign nationality are not considered (as they cannot vote in federal elections). The same applies to the 34.2% of young students who stated that they did not yet know which party they would vote for3 and to those who expressed an intention to vote for a Flemish party.4 In total, this analysis is based on 1283 pupils who met these criteria. 7The possible responses included – next to the Flemish parties – seven different French-speaking parties: the humanist party (cdH), the socialist party (PS), the ecologist party (ECOLO), the liberal party (MR), as well as three small parties (Front National, Parti des Jeunes Musulmans, Parti du Travail de Belgique) which were subsequently grouped together in the category “other”.5 We shall focus on the four major French-speaking political parties in the interpretation of the results. 8In order to determine whether the electoral characteristics of young students with an immigrant background effectively differ from those of “native” students from similar socioeconomic backgrounds, it is necessary to neutralise the influence of sociodemographic characteristics of students on their voting intentions. The Belgian electoral studies (Swyngedouw et al., 2007, Swyngedouw et al., 1998, Swyngedouw & Billiet, 2002, Delwit & Van Haute, 2008) highlighted several sociodemographic characteristics which traditionally have an influence on voting intentions: socioeconomic status, level of education, gender, religious services attendance and associative participation. The influence of these sociodemographic variables will therefore be neutralised in our analysis in order to measure the “net” influence of origin on the voting intentions of young students. 946% of young Belgian students in our sample stated that their mother was born in another country and are therefore considered to be with an immigrant background. The sample includes 96 different maternal nationalities. Due to their multiplicity, they had to be grouped: a sufficient number of pupils per category is necessary in order to analyse the sample accurately. 10We therefore grouped the maternal countries of birth into five categories which were the most widely represented in the sample: Belgians whose mother was born in Belgium (54.0%), those whose mother was born in Morocco (20.0%), those whose mother was born in Turkey (5.6%), those whose mother was born in the Democratic Republic of Congo (DRC) (5.6%), and finally, those whose mother was born in a country other than those mentioned above (other: 14.7%). This last category includes young students whose mother was born in a variety of countries such as Asian, South American, North American, African or, still, European countries. Our analysis will thus focus on the four categories referring to specific origin countries. It should be borne in mind that this categorisation is the result of a classification based on an “objective” criterion (the mother’s country of birth) with the aim of conducting a statistical analysis. This categorisation therefore does not necessarily correspond to the subjective identity of young students in Brussels. 11The indicator which measures the socioeconomic status of pupils used in this contribution is an indirect approximation, i.e. the mother’s education level. There is indeed an important correlation between the socioeconomic status and the education level of parents. Furthermore, the mother’s education level is easier for pupils to determine than the socioprofessional status or the social class of their parents. The variable measuring the socioeconomic status of pupils is composed of three categories: mother with a primary school diploma or lower (20.3% of the sample); mother with a secondary school diploma (35.6%); and mother with a higher education diploma (44.1%). 12Our sample is composed of 55.7% of young women. Furthermore, 58% of pupils were enrolled in general (academic track) education, 31.7% in technical education and 10.3% in vocational education. 13The variable measuring religious services attendance is composed of two categories: the first one includes pupils who attend less than once a month religious services (73% of pupils). The second one comprises pupils who attend religious services at least once a month. 14Finally, the “associative participation” variable includes two categories. The first one is composed of pupils who had participated in at least one activity of an association in the previous year. The second one comprises pupils who had not participated in any activity of an association in the previous year (14.1% of pupils). 15In order to estimate the impact of different sociodemographic variables on voting intentions, a multinomial logistic regression analysis was performed. This analysis allows a simultaneous comparison of the effects of structural variables on voting intentions for each political party. In a second step, and with the aim of simplifying the interpretation of the impact of structural factors on each political party, the estimations obtained in the multinomial logistic regression were transformed using the LEM program (Vermunt, 1997) following Kaufman and Schervish’s procedure (1986). This procedure allows the difference in the percentage for each sociodemographic category to be obtained with respect to the average percentage of voting intentions for each political party. This approach was introduced in Belgian electoral studies by Swyngedouw (1989). 16Table 1 presents the sociodemographic variables of the multinomial logistic model and the level of significance of their effects on the dependent variable. It enables us to verify whether each sociodemographic variable does indeed have a significant influence on the voting intentions of young students, by neutralising – or “controlling” – the effects of the other variables equally included in the model. According to those results, the differences in voting intentions according to the mother’s country of birth remain significant, even after neutralising the effects of the other variables in the model, including the socioeconomic status of young students. All of the variables – except the one measuring associative participation – have a significant effect on the voting intentions of young students. The latter is therefore not included in the final model. * significant with p. < 0.001. The first value in parentheses corresponds to χ², and the second value is the degree of freedom of the variable. Category of reference for political party: “other” vote Sociodemographic categories of reference: non-practising male pupil in general track, whose mother, born in Belgium, has a higher education diploma. 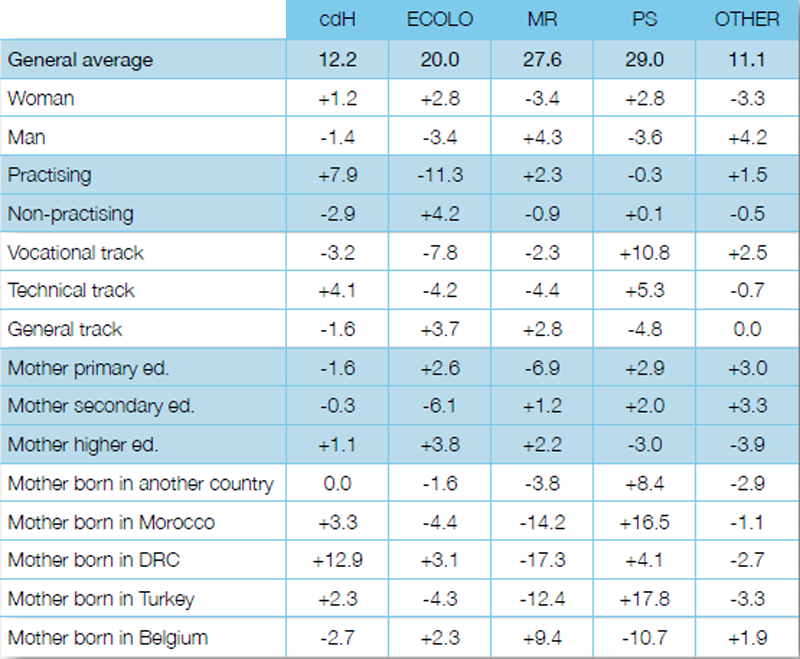 17In summary, this table forces us to reject our initial hypothesis: The voting intentions of young Belgian students with an immigrant background are significantly different from those of young students who are not of foreign descent, even after controlling for the effect of the other sociodemographic factors (such as the socioeconomic status). 18In order to carry out a more in-depth analysis of the influence of each of these structural variables, the effects of each category of the sociodemographic characteristics on the voting intentions of young students have been detailed in table 2. These effects are expressed as percentage point differences for each category with respect to the overall average percentage obtained by each political party in our sample. These percentage point differences are net, i.e. they were estimated by controlling the influence of the other structural variables on voting intentions. These are, hence, not simple bivariate results (the “gross” effects). 19Thus, if we consider the category of women (while holding the other variables of the model constant), women’s intentions to vote for the MR will be 3.4 percentage points lower than the voting intentions for the MR of the entire sample (27.6%). The MR therefore obtains 24.2% of women’s voting intentions, after controlling the influence of all the other variables in the model. The percentage difference between one category and the general average – which is expressed in percentage point differences – must therefore be interpreted in relation to the weight of the political party to which it corresponds. For example, a difference of 3 percentage points is a relatively larger difference for a political party such as the cdH, for which the general average of voting intentions is 12.2%, than for the socialist party (for which the general average of voting intentions is 29%). 6 Small variations are nevertheless possible as we have rounded off the figures. 22The main differences concerning gender are observed with the PS, the MR and ECOLO. After controlling the other variables in the model, young women tend to vote more for the socialists (+2.8) and the ecologists (+2.8). In contrast, there are more young men with the intention to vote for the MR (+4.3). But let us specify the correct interpretation of these tendencies: the MR of course still attracts a large proportion of women’s voting intentions (24.2% of women vote for the MR, after controlling the other variables in the model, compared with 22.8% of women voting for ECOLO and 31.8% for the PS). 23The two noteworthy results related to regular religious services attendance are observed for the cdH and ECOLO. Many more pupils who say they are practising have the intention to vote for the cdH (+7.9). However, they are less likely to want to vote for the ecologists (–11.3). Let us underline once again the correct interpretation of the tendencies. After controlling the impact of the other variables in the model, 20.1% of young voters, who say they are practising, vote for the cdH, 9.7% vote ECOLO, 30.9% vote MR and 28.7% vote PS. 24Let us now examine the percentage differences for voting intentions related to maternal level of education. The PS attracts more young students whose mother has a primary (+2.9) or secondary (+2.0) education than those whose mother has a higher education diploma (–3.0). The latter intend more often than the average to vote for the ecologists (+3.8) and for the MR (+2.2), and slightly more often than the average for the cdH (+1.1). Young students reflect the traditional profiles of PS, MR and ECOLO voters: relatively more pupils with a high socioeconomic status (whose mother has a higher education diploma) intend to vote for the MR and ECOLO, whereas relatively more pupils with a lower socioeconomic status intend to vote for the PS.8 The cdH obtains practically equal scores among young students regardless of the mother’s level of education. 25The same patterns observed with regard to the effect of socioeconomic status, reappear when we examine the effect of the educational track of pupils. Compared with the average, many more students in vocational education (+10.8) and technical education (+5.3), and less pupils in general education (–4.8), intend to vote for the PS. More pupils in general education (+3.7) and less pupils in technical education (–4.2) and especially in vocational education (–7.8) intend to vote for the ecologist party. The same tendency is to be observed for the MR: more pupils in general education (+2.8) and less in technical education (–4.4) and vocational education –2.3) intend to vote for the right-liberals (with respect to the general average of intentions to vote for the MR). 26There are also consistent effects on the intentions to vote for the cdH: more young students in technical education (+4.1) and less in vocational education (–3.2) and general education (–1.6) intend to vote for them. 27It would be interesting to carry out a more detailed analysis of the relationship between the type of track and the voting intentions of young students. One might come up with several explanations for these results, which are unfortunately impossible to verify with our data:9 the differences encountered with the track variable – which point mainly in the same direction as those related to the mother’s level of education – could be related to the socioeconomic status of pupils, as the education system in francophone Belgium and in Brussels in particular is very inequitable (Delvaux et al., 2005, Hirtt et al., 2007, Jacobs and Rea, 2007, Janssens, 2009). Given that the mother’s level of education is not a perfect representation of the socioeconomic status of pupils, the differences encountered within the education track variable may be due to the pupil’s socioeconomic status and not to their education track. However, the differences related to education track might just as well in actual fact be due the educational pathway as such. To complicate the issue, schools may have an influence on pupils not only due to the education offered (the topics touched upon in class, for instance) but also due to peer pressure or school composition effects: school is, indeed, both an institution and an arena of socialisation. 28If we compare the voting intentions of Belgian students with an immigrant background to the general average for each party, we notice that the cdH interests students of Congolese origin most (+12.9), and to a lesser extent pupils whose mother was born in Morocco (+3.3) or in Turkey (+2.3). 29The intentions to vote for the PS among pupils of Moroccan or Turkish origin are much larger than the average for the PS (Morocco: +16.5; Turkey: +17.8). Likewise, although to a lesser extent than in the case of pupils with a Moroccan or Turkish origin, young students of Congolese origin are more likely than average to vote for the PS (+4.1).10 Pupils who are not with an immigrant background are much less likely than the average to tend to vote for the PS (–10.7). 30Young students of Congolese origin make up the group of those who support the ecologist party more often, with voting intentions 3.1 percentage points larger than the average. They are followed by pupils whose mother was born in Belgium (+2.3 points). Young students whose mother was born in Morocco or in Turkey intend to vote less frequently than the average for ECOLO (Morocco: –4.4; Turkey: –4.3). 31As regards the results for the MR, pupils with an immigrant background - irrespective of the mother’s country of birth – intend to vote for the liberals considerably less frequently than the average (Congo: –17.3; Turkey: –12.4; Morocco: –14.2). This does, of course, not mean that none of the young students with an immigrant background intends to vote for them.11 It simply means that the proportion of pupils with an immigrant background who intend to vote for the MR is lower than the average. Young students whose mother was born in Belgium are, in contrast, much more likely than the average to vote for the MR (+9.4). 32Figure 1 illustrates these results by comparing the voting intentions of young Belgian students of Moroccan, Turkish and Congolese origin, as well as those of young students who are not of immigrant descent, to the general average (for each party) of voting intentions. The results presented in figure 1 are the net results: the influence of the other structural variables is neutralised. Here we can clearly see the positive impact of Moroccan and Turkish origin and, to a lesser extent, Congolese origin on the intentions to vote for the socialist party. The intentions of young students with an immigrant background to vote for the MR are lower than the average, regardless of the mother’s country of birth. However, young students of a non-immigrant background have much lower intentions to vote for the PS, whereas their intentions to vote for the MR are considerably larger than the average. Pupils whose mother was born in the Congo are much more likely than the average to vote for the cdH. Finally, young students whose mother was born in the Congo and pupils who are not from an immigrant background are slighty more likely than the average to vote for the ecologist party. 33In recent years, the population with an immigrant background has become an important electoral force in several areas in Belgium, including the Brussels region (Deboosere, 2009). The electoral preferences of groups with an immigrant background have not been examined, however, which has led to all sorts of speculation. In this article, we have presented the first analysis of the electoral preferences of young Belgian students with an immigrant background who were voting for the first time, by using data gathered from students attending the last year of the secondary education in schools of the Brussels-Capital Region. We have attempted to determine whether Belgian students with a non-European immigrant background had special electoral preferences which could not be explained by other sociodemographic characteristics such as gender, socioeconomic status, level of education, religious services attendance or associative participation. Our data clearly suggest that the electoral preferences of Belgian students with an immigrant background cannot be entirely explained by traditional sociodemographic characteristics. 34Indeed, the country of birth of mother of young students still has a significant impact on voting intentions, after control for other variables. Compared with the average, a larger proportion of Belgian pupils with an immigrant background intends to vote for the PS and the cdH. 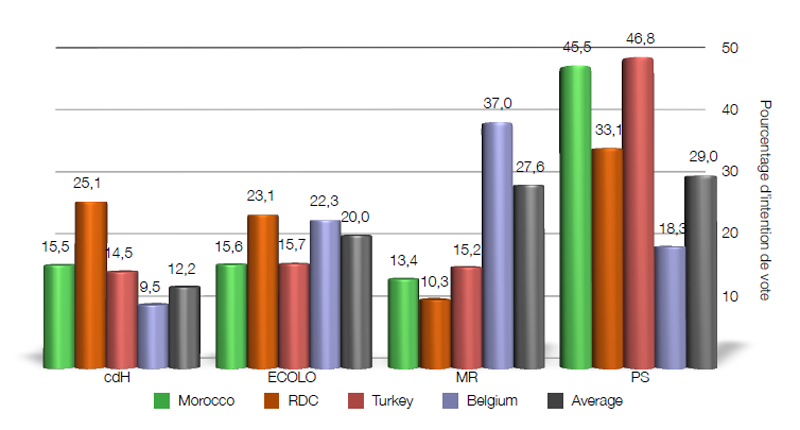 The results for ECOLO, however, are more contrasted: there are slightly less young Belgian students of Turkish and Moroccan origin who intend to vote for the ecologists compared with the average, whereas there are slightly more pupils of Congolese origin who intend to vote for ECOLO. Overall, young Belgian students with an immigrant background are significantly less likely to vote for the MR compared with the average. However, the electoral behaviour of young students with an immigrant background remains diversified: the four main French-speaking political parties are indeed capable of attracting their votes. 35A study conducted in the Netherlands (Tillie, 1998) may provide some explanation of these findings with regard to the electoral preferences of young Belgian students with an immigrant background. According to Tillie, the left-right ideology of parties is not the only deciding element in the voting preferences of people with an immigrant background. As well as ideological affinities, voters with an immigrant background may prefer a party which includes one or several candidates of the same origin as the voter on its list. They might also prefer a party with a doctrine and a programme in favour of the immigrant population and voters with an immigrant background. They would therefore choose the political party first of all based on their general ideological preferences (for example the left-right cleavage), and then determine their final choice by considering the profile of candidates on the list. If we look at the profile of candidates in the parliamentary elections for the Brussels-Capital Region in 2004 (Jacobs et al., 2006), close to 28% of candidates whose two parents did not have the Belgian nationality were on the list of the PS. The two other main parties which attracted candidates with an immigrant background were ECOLO and the cdH (14.7% each). These candidates were mainly of Moroccan and, to a lesser extent, Turkish origin. It should also be mentioned that the origins of candidates with an immigrant background on the lists of the cdH were more diversified than those of the PS or ECOLO. The cdH lists included several candidates of Congolese origin. The profile of political candidates in the Brussels region could therefore shed light on the vote preferences of young students with an immigrant background for the PS and, to a lesser extent, for ECOLO and the cdH. This link between the profile of political candidates and the voting intentions of young Belgian students with an immigrant background unfortunately cannot be verified with our data. However, a forthcoming study (Jacobs et al., to be published) does indeed show that voterswith an immigrant background in Brussels have a greater tendency than others to vote specifically for a political candidate of foreign origin. The authors would like to thank the pupils and their schools for agreeing to participate in the survey in spring 2007. They would also like to thank the students at the ULB and VUB who helped collect the data. We furthermore wish to express our gratitude to the reviewers of Brussels Studies for their comments on an earlier version and to the editors for their translation of the original French text into Dutch and English. This project was carried out thanks to the financial support of the “Prospective Research for Brussels” programme of the Brussels-Capital Region as well as the Crédits Extraordinaires de Recherche from the ULB. DEBOOSERE, P., EGGERICKX, T., VAN HECKE, E. & WAYENS, B. (2009) La population bruxelloise : un éclairage démographique. Brussels Studies. http://brussels.revues.org (consulted on: 30 January 2009). DELVAUX, B., DEMEUSE, M., DUPRIEZ, V., GUISSET, C., FAGNANT, A., LAFONTAINE, D., MARISSAL, P. & MAROY, C. (2005) Les bassins scolaires : De l’idée au projet. Propositions relatives aux domaines d’intervention, aux instances et aux territoires. Research financed by the French Community of Belgium. JACOBS, D. & REA, A. (2007) Brussels youth: between diversity and adversity. Survey of secondary school students in downtown Brussels. Brussels Studies, 8. http://brussels.revues.org (consulted on: 30 January 2009). JACOBS, D., TENEY, C., REA, A. & DELWIT, P. (forthcoming) Voting patterns among ethnic minorities in Brussels (Belgium) during the 2006 local elections. JANSSENS, R., CARLIER, D. & VAN DE CRAEN, P. (2009) L’enseignement à Bruxelles. Brussels Studies. http://brussels.revues.org (consulted on: 30 January 2009). SWYNGEDOUW, M. & BILLIET, J. (2002) De kiezer heeft zijn redenen. 13 juni 1999 en de politieke opvattingen van Vlamingen, Leuven, Acco. SWYNGEDOUW, M., GOEMINNE, B. & BILLIET, J. (2007) Les déterminants structurels et culturels du vote en Flandre (1999‑2003). in FROGNIER, A.-P., DE WINTER, L. & BAUDEWYNS, P. (Eds.) Élections : le reflux ? Comportements et attitudes lors des élections législatives de 2003 en Belgique. Brussels, De Boeck. VERMUNT, J. K. (1997) LEM: A General Program for the Analysis of Categorical Data. Tilburg, Department of Methodology and Statistics, Tilburg University. 2 The municipalities selected in the sample for their geographic and demographic representativity of the overall Brussels Capital Region are: Anderlecht, Auderghem, Brussels-City, Molenbeek, Schaerbeek, Uccle and Watermael-Boitsfort. 3 It should be underlined that the data were gathered from the end of February until the end of May 2007, and that the Belgian federal elections were held on 10 June 2007. The period of data gathering partly explains the especially high level of undecided voters. The percentage of undecided voters is larger in schools where data gathering was conducted during the first weeks of the survey (Cramer’s V of 0.22; p. < 0.001). The undecided voters do not have a particular sociodemographic profile (all Cramer’s Vs of sociodemographic variables for the categories of undecided and decided voters are lower than 0.1). 4 The number of young students who intended to vote for one of the Flemish parties was too low in our sample to allow a detailed multivariate analysis. The results of the Dutch-speaking parties among all Belgian students with voting intentions were: CD&V-NVA: 3.9%; Groen ! : 5.0%; Lijst Dedecker: 0.3%; SP.A-Spirit: 2.8%; Open-VLD: 3.4% and Vlaams Belang: 3.4%. 5 In this case as well, the number of pupils who intended to vote for one of the three minority francophone parties was too low to allow a detailed multivariate analysis and valid interpretation. The category “other” also includes young students who answered: “I am going to enter a blank vote (render a ballot paper invalid)”. The category “other” cannot really be interpreted, considering the disparate nature of parties grouped with the blank vote. 7 Once more we would like to stress these are not bivariate analyses (gross results) but rather a multivariate analysis procedure which is much more sophisticated and is aimed at isolating net effects. 8 Nevertheless, among students whose mother has a high level of education, the PS obtains 26%, making this party more popular than ECOLO (23.8%). 9 The characteristics of our sample and questionnaire do, in this case, unfortunately not allow an in-depth analysis of the impact of schools (through a multilevel analysis) on the voting intentions of young students. 10 The PS remains the most popular party among students of Congolese origin (33.1%). The CDH obtains 25.1% of votes in this category of students. Needless to say, these results are obtained after controlling the influence of the other variables in the model. 11 After controlling the other variables in the model, the MR still obtains 13.4% of votes of students of Moroccan origin, 10.3% of votes of students of Congolese origin and 15.2% of votes of students of Turkish origin. Céline Teney has a Magister degree in sociology and ethnology from the Albert-Ludwigs Universität in Freiburg (Germany), and is currently a member of the METICES research centre at the Université Libre de Bruxelles. Within the framework of her PhD thesis, her research focuses on the attitudes of pupils in Brussels towards minorities with regard to gender, socioeconomic status and ethnicity. Dirk Jacobs is an Associate professor at the Université Libre de Bruxelles and is a mem-ber of the METICES research centre. He has written many academic articles on the inte-gration of people with an immigrant background which have been published in various international journals (International Migration, Journal of Ethnic and Migration Studies and Journal of International Migration and Integration, among others), and has recently collaborated on the development of the Migrant Integration Policy Index (MIPEX).